You may have noticed that some of your SKUs have a red toggle to list them on various marketplaces and are also in the "not listable" section of a channel. This is because we've identified one or more Critical Issues for this SKU. These are issues that will most likely return an error if we were to try to list them on most marketplaces. Please refer to the below guideline for information on the most common critical issues and how you can fix them! We'll define each critical issue and how to resolve them directly as well as how to access your Critical Issue Report. Critical Issues will result in SKUs being "Not Listable" because we know the SKU is missing required information that will prevent it from listing successfully. To get more SKUs "Listable" please resolve the critical issue. Please Scroll to the Bottom of this FAQ for instructions on how to download your Critical Issues in CSV format. This Product does not have a Title - This implies that this SKU does not have a Title filled in on Zentail. To resolve this issue, simply add a title to the SKU! Amazon products must have an ASIN. 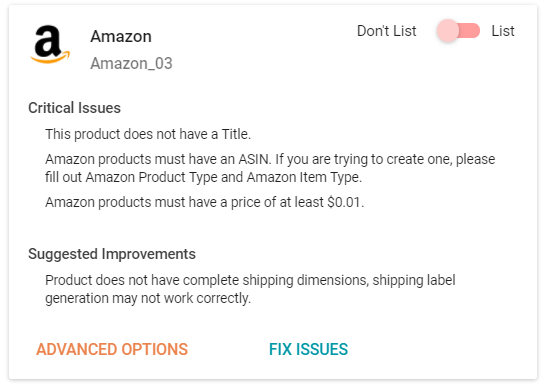 If you are trying to create one, please fill out Amazon Product Type and Amazon Item Type - This message is telling us that your SKU does not have an Amazon Item Type or Product Type filled in. The fastest way to fix this is to add a Smart Type. Read more here on how to add a Smart Type. Amazon products must have a price of at least $0.01 - This critical issue is pointing out that this SKU either does not a price filled in, or it has a price of $0.00. You will need to add a price to the SKU before you can list this to Amazon. 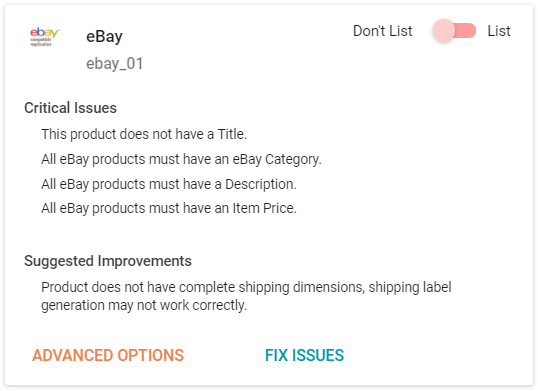 All eBay products must have an eBay Category - This message is telling us that your SKU does not have an eBay Category filled in. The fastest way to fix this is to add a Smart Type. Read more here on how to add a Smart Type. All eBay product must have a Description - eBay does not allow you to create a listing without a description filled in. Please add a description on Zentail to resolve this issue. All eBay products must have an Item Price - This critical issue is pointing out that this SKU either does not a price filled in, or it has a price of $0.00. You will need to add a price to the SKU before you can list this to eBay. Missing field required for this product category: mpn (for mpn on eBay). - This indicates that this eBay category requires an MPN. Please fill in an MPN to list to eBay. If this product down not have an MPN, we recommend using "Does Not Apply". Missing field required for this product category: brand (for brand on eBay). - This indicates that this eBay category requires an Brand. Please fill in an Brand to list to eBay. Missing field required for this product category: UPC (for UPC on eBay). - This indicates that this eBay category requires an UPC. Please fill in an UPC to list to eBay. Jet requires either a valid UPC or Brand and MPN - To make this SKU listable to Jet.com, you will need to add either the UPC or the Brand and MPN. This way, Jet can properly match your product with an existing listing or create a new one if necessary. 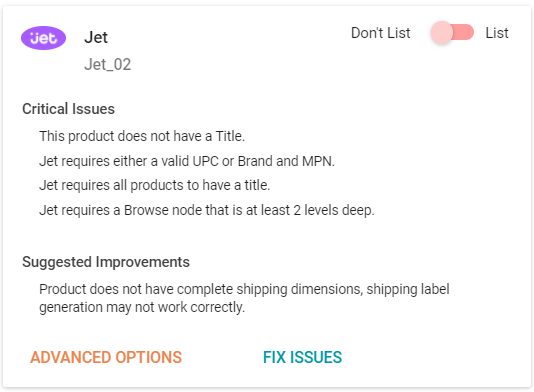 Jet requires a Browse node that is at least 2 levels deep - This message is telling us that your SKU does not have a proper Jet Browse Node filled in. The fastest way to fix this is to add a Smart Type. Read more here on how to add a Smart Type. 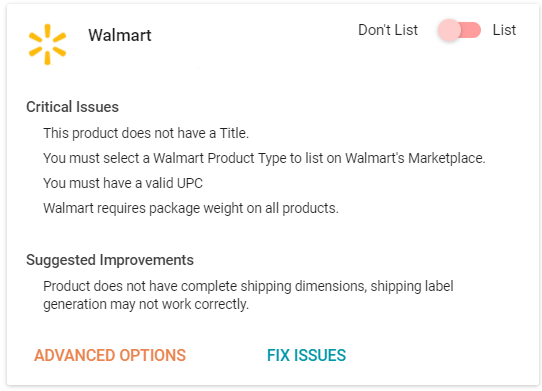 You must select a Walmart Product Type to list on Walmart's Marketplace - This message is telling us that your SKU does not have an Walmart Product Type filled in. The fastest way to fix this is to add a Smart Type. Read more here on how to add a Smart Type. You must have a valid UPC - To make this SKU listable to Walmart Marketplace, you will need to add a valid UPC. This way, Walmart can properly match your product with an existing listing or create a new one if necessary. Critical Issues are dependent on the channel, so you can download a critical issue report for each channel. Click on the channel for which you would like to view the critical issues: For example, "[Your Company] (eBay)"
Click on "Product Critical Issues". Leave "Active Products Only" checked if you only want to look at Active SKUs. To look at all SKUs, Active and Inactive (Archived), Uncheck this Checkbox. The report will appear under "Previous Exports"